Everything you ever wanted to know about hand pumps	And MORE! A hand pump is an uncomplicated piece of equipment. Determining the right hand pump for you is a little more complex. The experts at Bison Pumps want to help you. If you don’t need this information, please see the tabs above or go to our Deep Well Selection Chart or Shallow Well Selection Chart. Prior to purchasing a hand pump, there is information you need to consider in order to purchase the correct pump for your application. We have created a Bison Pumps Cheat Sheet to take with you when you go to your well to get your measurements. Bring a tape measure, adjustable wrench to remove well cap, and a weighted string to measure the static water level. See video below to help you measure your well casing. Prior to going to the well, be sure to turn off the electricity to the electric pump in the well. If you have been using a lot of water, please wait 30 minutes for your well to refill. Here is why each measurement on your Bison Hand Pump Cheat Sheet is important. Question 1. My static water level is… Hand pumps, unlike electric pumps draw from the top of the water not the bottom of the well. Static water level is defined as the distance between the ground and the top of the water in your well. To determine your static water level, drop a weighted nylon string into the well casing until you hear it or see it splash the surface of the water. Mark the string where it lays on the top of the well casing. Pull the string out and measure with a tape measure from your mark to the weight on the other end of the string. When the static water level is GREATER than 25′ feet, then you must use a deep well hand pump; as these pumps lift water (not suction like a shallow well pump). Deep well hand pumps can access great depths, but the further down you install the cylinder, the more water you are lifting. This means it will be harder to pump. ***Water weighs approximately 1/2 pound every 12″ of 1 1/4″ pipe. *** See Deep Well Selection Chart for your options. In order to accommodate the heaviness of the water, you can decrease your cylinder and pipe size, but that will yield less water volume. At some point with any hand pump system, an extremely deep static water level is too difficult to pump for the trickle of water you will obtain. See our Cylinder Spec Sheet on the pumping difficulty at various static water levels using the (4) different cylinder sizes we offer. With inline hand pump applications, the electric well pump is installed at the bottom of the Bison Pump cylinder. There are (2) sizes of inline cylinders. If you have a higher performing pump (10 gpm or more), then you should purchase the 2 1/2″ inline cylinder. NOTE: if silt or sand is an issue for your well pump, it will be an issue for a hand pump. Those particles can clog your cylinder or unseat your o-rings or cups seals. We recommend you purchase a silt screen with your Bison Pump to protect your cylinder. Also, repair kits are available for deep well cylinders and the piston assemblies in a shallow well hand pump. There is no routine maintenance required. Each deep well system consists of the hand pump, pipe, rod, and a cylinder. When you purchase a Bison Deep Well Hand Pump, you also receive an aluminum paddle, rod retrieval tool, and safety rope to help you install your pump easily and safely. NOTE: Bison Pumps uses 304 stainless steel lift rod as opposed to fiberglass. We chose this because 1) 304 stainless steel is NSF61 water-potable and FDA approved (where fiberglass is not) and 2) the tensile strength of stainless steel is 73,200 vs 20,000 for fiberglass. Many people ask how a deep well hand pump doesn’t freeze. Prior to installing the last piece of pipe and rod, drill an 1/8″ weep hole in the pipe just below where the frost line is for your area. This will allow the water to seep back to that point, yet maintain its prime due to the check valve in the cylinder. * This does not apply for inline hand pumps where freezing may occur. If there is an electrical pump in the well and the wires come out the top of your casing, Bison’s Deep Well Hand Pumps have a hole in the well adapter for the wires to come out the top. You can purchase either a top mount conduit for the wires or if state and local regulations permit, you can drill a hole in your casing for the side mount conduit ell. 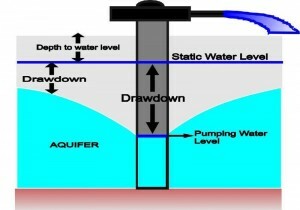 If you have a jet pump system, a one-pipe system (on left) indicates a shallow static water level. A two pipe system (on right) indicates you have a deep static water level. NOTE: All Bison Pumps are pressure pumps, which means they are a closed system and can be used to pressurize a tank. Bison Pumps sells check valves and pressurizing kits (includes 5′ stainless steel hose) for this purpose. Also, all pumps have a hose bibb adapter to attach a garden hose to the spout. If your static water level is LESS than 25′ feet, then you can use a deep well hand pump on the well casing, a shallow well hand pump on the well casing or inside the home connected through either the submersible or jet pump water lines. Unlike the deep well hand pump, the shallow well hand pump is a suction pump and it pulls water up using a vacuum. Therefore, due to the laws of physics, it can never pull from a vertical depth of more than 33.9 feet at certain atmospheric pressures. Taking all things into consideration, we advise when choosing a shallow well hand pump that your vertical lift be no more than 25 vertical feet from the top of the water to the bottom of the pump where it will be installed. See Tech Support for common installation issues that may affect the functioning of a shallow well hand pump. Because Bison Pumps are a closed pump, they are able to pressurize tanks and they hold their prime due to a check valve in the base of the pump (or cylinder in the case of a 2-piece pump). Bison Pumps use buna rubber cups seals and o-rings which do not require routine maintenance. You may install a shallow well hand pump inside your house (see installation diagrams below), outside permanently, or with our quick disconnect option to remove as you need. The quick disconnect option can be purchased as a flange to mount on a cover or with a well adapter for well casings. See our Shallow Well Selection Chart. If you have an overflowing well, also known as an artesian well, then you will need to drain off the overflow away from the casing. One way of doing this would be to install an 1 1/4″ or larger pitless adapter inside the casing, connect a poly plastic pipe to the pitless adapter, and take it away to drain. Question 2. My inside diameter of my well casing… and Question 3. My outside diameter of my well casing… These questions need to be answered for all deep well applications and shallow well quick disconnect applications with well adapter mount. When Bison Pumps manufactures hand pumps, the well adapter is one solid piece. The purpose of this is to eliminate the potential for contaminants to enter your well. Bison offers their well adapters as a center-mount and an offset-mount. A center-mount is for wells with no pump in the well. The pipe will go directly down the center of the well casing. An offset-mount is for wells with an electric pump so the pipe and rod attached to the hand pump can go down beside existing piping and hardware in the casing. Question 4. My well casing height is… the purpose here is to determine (2) things; 1) is there enough well casing to connect the Bison well adapter and 2) is it a comfortable height to pump. The Bison well adapter needs at least 4″ of well casing to connect to (the commercial pump needs 6″). As to the pumping height, if it is a below grade application, you can purchase the Bison DW Low Profile Pump or extend your casing. A casing which is 12-18″ is usually a comfortable height for an average person. Question 5. My well casing material is… typically different materials come in various sizes. If someone is questioning their inside and outside diameter measurements, the material often helps determine the answer. Not having a well casing means it is either a driven point well or has a well cover. If this is the case, you would purchase the well point pump or the flat flange pump. Question 6. My well has a submersible… Pipes. Wires. Pitless. Obstructions. Pipes from an electric pump in the well come out of the well casing through a pitless adapter or out the top of the well casing. Bison Pumps offers the deep well and low profile hand pumps with a 1 1/4″ submersible pipe connection out the top of the well adapter to accommodate this pipe. As mentioned before, wires can either come out the top of the well adapter or the side of the casing. The pitless adapter in standard 6″ casings, typically allow enough clearance for the Bison 3″ cylinder. With a smaller casing, we recommend measuring the clearance to determine which cylinders can clear the opening. Another option is to remove the pitless adapter in order to install a larger cylinder, then replace the pitless adapter. * In some states, the approved pitless adapters are quite large and they are often in smaller casings leaving little room for both the hand pump pipe and cylinder and the electric pump piping. Depending on the inside diameter, you may be able to use a 1 1/2″ or 2″ cylinder if you remove the pitless adapter or install a different pitless adapter. Obstructions such as a liner, wire-stand offs, or torque arrestors may impede the installation of a Bison Pump. Wire stand-offs and torque arrestors can be removed as far down as the Bison installation requires. As for a liner, depending on their inside dimension and where they start, this may affect the size of the piping or cylinder you can use. Some states typically have linings. Call Bison Tech Support to help you determine which system you can use. Optional information to provide, if you have it. The depth of my submersible is ______feet. Recovery rate of my well is ______ gpm. The only reason knowing the depth of the submersible is if there is not a lot of depth between the static water level and the electric pump. You will want to make sure there is 2-3′ between the Bison cylinder and the electric pump in the well. If you have a very slow recovery rate, then a hand pump which delivers 5 gallons per minute (or commercial 12 gpm) may drain the well past the suction point of the cylinder yielding no water until the well recovers. With deep wells with a very slow recovery rate, you may consider purchasing additional pipe and rod to lower the cylinder deeper into the well. Bison Pumps can design and manufacture a hand pump for your specific application. Call Tech Support today for special requirements. Because we love to create, check out our Bison Beverage Pump and Bison Bean Pot! In 1998, Maine experienced a weather event which crippled parts of the northeast and Canada. The ice storm would leave millions without power for days and in some cases weeks. It was during this time, Harbison Plumbing and Heating in Houlton, Maine received phone calls asking about hand pumps that would go on a well casing to provide water when the power was out. Always with an eye to helping customers, David Harbison Jr. and a team of skilled craftsmen and professionals hit the local hardware store in research and development mode. It was then the Bison Pump was born. Currently, Bison Pumps manufactures hand water pumps for both shallow and deep well applications. Recent additions to the Bison Pumps product line is the commercial hand pump capable of yielding 12 gallons per minute, the low profile pump for below grade or covered well casings, and the utility shallow well hand pump for an economical emergency use application. Spreading into a new market for playgrounds and education centers, Bison developed the playground pump kit and child-safe pumps. “If you want access to your well water and physics does not render it impossible, then Bison Pumps can do it. We sell many custom application pumps every year. Recently, we modified our shallow well pump for a playground in Singapore to demonstrate how water is used to create energy. A customer wanted to pump saltwater into her hot tub, so we created a shallow well hand pump from 316 stainless steel to prevent corrosion. Every day is a challenge, but in a good way. When you have to adjust daily to meet customer’s needs, then change becomes easier in all aspects of the business,” said Harbison. Not only has the Bison Pumps product line expanded, the entire organization has taken the next steps to facilitate growth. Precision machining equipment, lean manufacturing, and an exemplary safety program make Bison Pumps a company prepared for growth. ALL SALES ARE FINAL. NO RETURNS AS EACH PUMP IS SPECIFIC TO YOUR APPLICATION.